A visit to the Philippines is never complete without having a taste of Filipino cooking. Filipino cuisine is as diverse as the islands; there’s a different specialty in almost every town, city or province. Whether the purpose of your visit is business or leisure, Filipino food will make it an unforgettable gastronomic adventure. Traditional cooking methods, homegrown ingredients and rich flavors are the markers of Filipino cuisine. Though Spanish, American and Asian influences are evident, Filipino food is made unique by the passion with which it is prepared. Filipinos love food, to the point that eating has become a hobby for most. 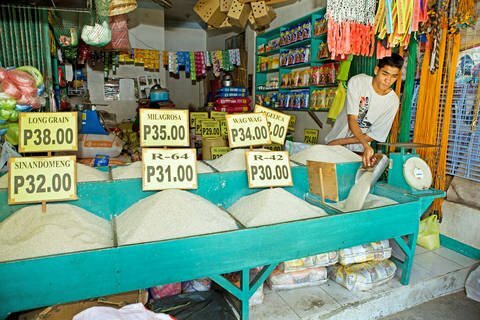 Most Filipinos eat full meals at least three times in a day, plus morning, afternoon and sometimes, midnight snacks. Breakfast is typical: eggs, tapas and of course, sinangag (fried rice). Now the fried rice varies on every table; it can be just plain or it can be a mixture of different tasty treats, including sausages, longganiza, vegetables, dried fish and even leftovers from last night’s dinner. Lunch and dinner are almost similar. A typical Filipino meal has a bowl of soup, a cup (or two) of rice, at least one viand, soy sauce or any kind of dip on the side and a bottle of Coke. Sometimes, if the budget allows, dessert is also served. For health-conscious eaters, a slice of fruit is also in order. Merienda (snacks) is also an important part of Filipino dining. Be it a traditional puto (rice cake) and dinuguan (pig’s blood stew) or a version of the American burger, a typical Pinoy eats in between meals. Nocturnal citizens consider eating street food a part of their routine. 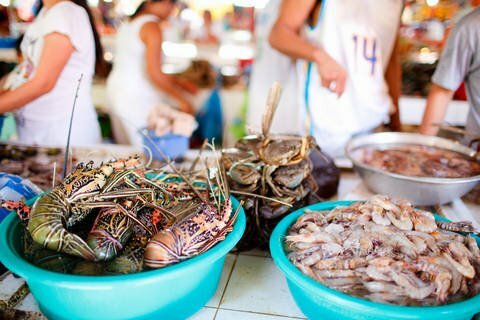 Being a group of islands means there’s really no shortage of fresh seafood in the Philippines. From tuna and groupers to crabs, lobsters and prawns, the freshest catch is always available in markets and restaurants all over the country. One good way to experience seafood in the Philippines is to head to wet markets, buy your choice of seafood and have a local carenderia (eatery) prepare it for you. There are some wet markets that offer buy-and-cook options for visitors at very affordable prices. Filipino cuisine is an attraction on its own. One can plan a trip to the Philippines if only to experience the best of culinary delights that the Filipino cook has to offer. Whether you are looking for classic specialties, local delicacies or exotic street food, there’s always something tasty waiting in every corner of the country. Filipino cuisine is indeed something that will truly impress even the most discriminating foodie.